We are a leading UK supplier of high specification rooflights. We supply to homeowners, master builders, architects and construction contractors. Our rooflight collection includes fixed skylights, opening & access hatch roof windows, pyramids, lanterns, walk on rooflights / floorlights and bespoke rooflights. We are inspired by our belief in creative thinking and engineering excellence and thrive on exceeding our client’s expectations. We realise each client’s needs are individual and pride ourselves on excellent customer service from enquiry to delivery and beyond. 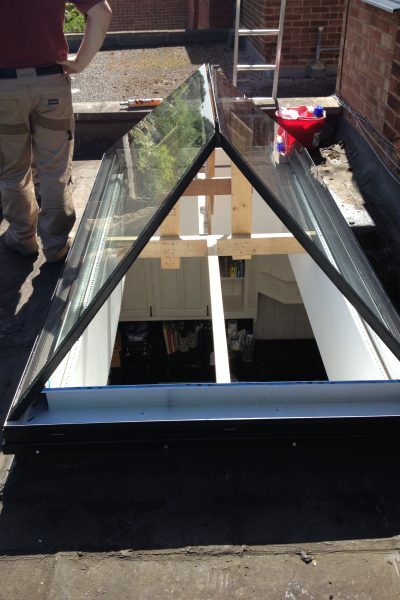 We’re continually striving to perfect and develop the rooflight solutions we provide. Our passion lies in creating innovative design solutions using glass to enhance and transform any environment, maximising the natural elements of light and space. Bringing more of the outside in, creating a more seamless transition between the two, enabling you to enjoy all the benefits. We believe the difference, when you choose Vision AGI is crystal clear. Let Vision AGI take care of all your rooflight needs, with so many products to choose from the rooflight collection with our standard sizes and tailor made options plus our bespoke rooflights service – we believe the difference, when you choose Vision AGI is crystal clear. We don’t just deliver rooflights, we deliver light with style & elegance. 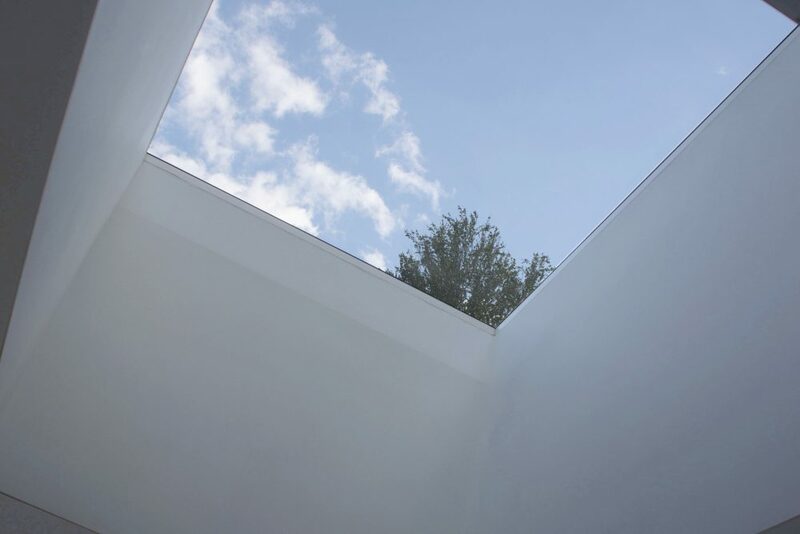 Fixed Skylight; traditional timeless classic; its simplistic design forms clean elegant lines and would be the perfect addition to your roof, bringing an abundance of natural light into any room. Opening Roof Windows; ideal for those wanting the look of an elegant roof window with the added functionality of allowing both natural light and ventilation, manually or at the click of a switch. Access Hatch Roof Windows; classic, traditional and elegant roof window with a difference: it provides the advantage of opening fully, so has a dual function giving you an extra point of access to your roof space. Pyramid Rooflights; stylish and contemporary design, engineered to maximise the amount of natural light. Lantern Rooflights; contemporary design with a more architectural feel. Giving added height and volume to your room. Providing maximum light with that all important WOW factor. Walk On Glass Floors; strong, safe and aesthetically pleasing where transparency and light are needed in the room below. 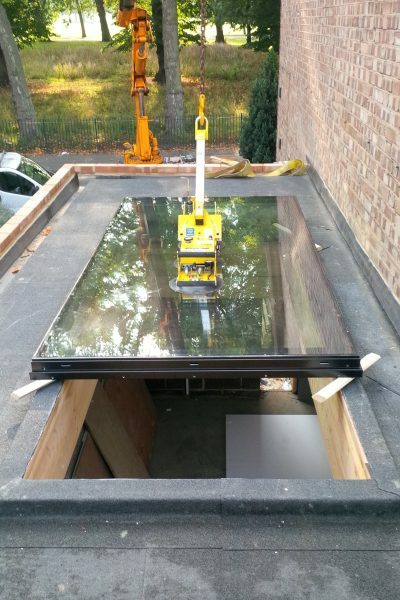 We specialise in creating truly bespoke rooflight solutions. 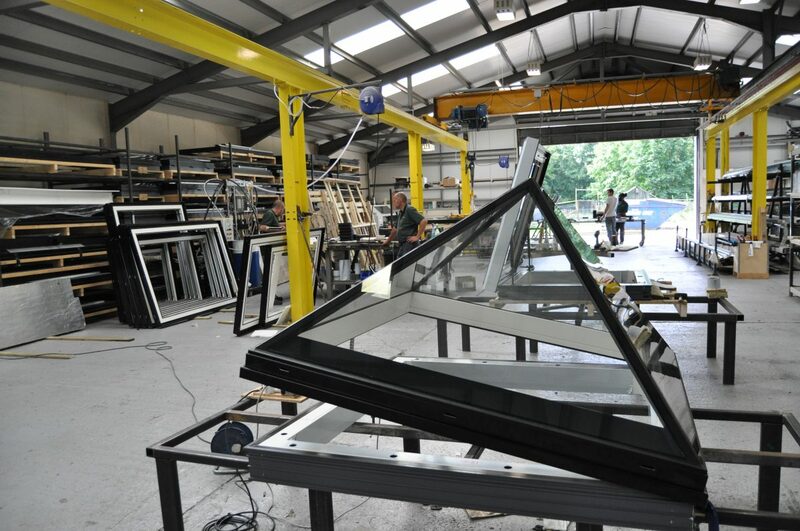 You can choose from a limitless range of options to suit your every rooflight need and form a custom-made solution. Please see details below for the specification used in our Standard Size Rooflights. Our rooflights can also be customised with various glazing options; finishes vary and can sometimes be utilised in multiple combinations. You could also upgrade and choose the external frame colour from a variety of RAL colours. You can do this by selecting one of our tailor made options from the Rooflight Collection or by creating a truly Bespoke Rooflight of your very own. The options are endless – the only limitation is your imagination! 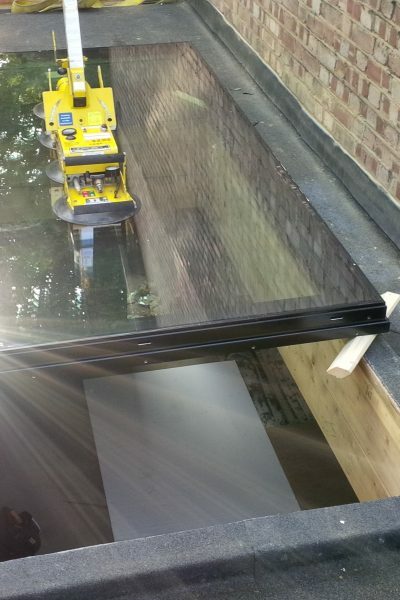 Our rooflights as standard feature 32mm DGU toughened safety glass with low-e coating and warm edge spacer (with the exception of the walk on rooflights / floorlights, as the glass specification is determined by the size and loading requirements). 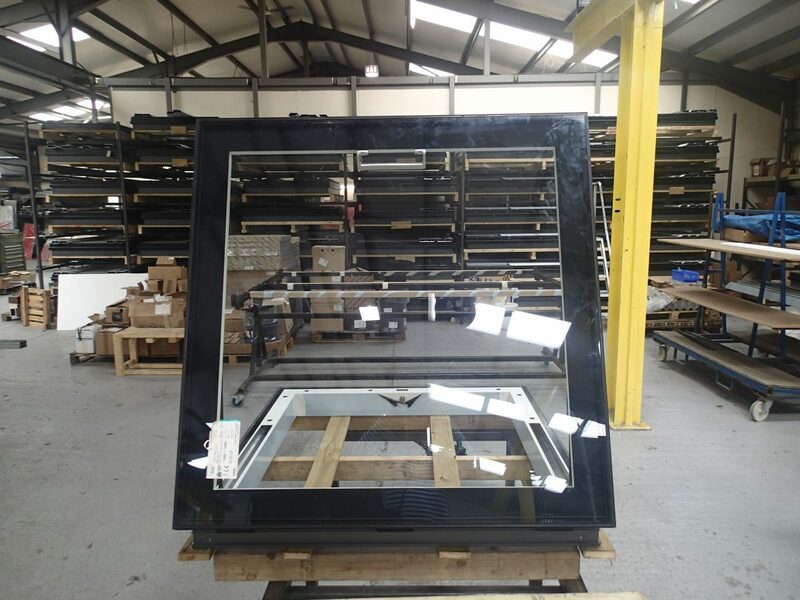 Standard glass specification centre pane U-value is 1.1 W/m2 K.
Manufactured from our own 6063-T6 aluminium profile, thermally broken with 32mm polyamide insulation sections. 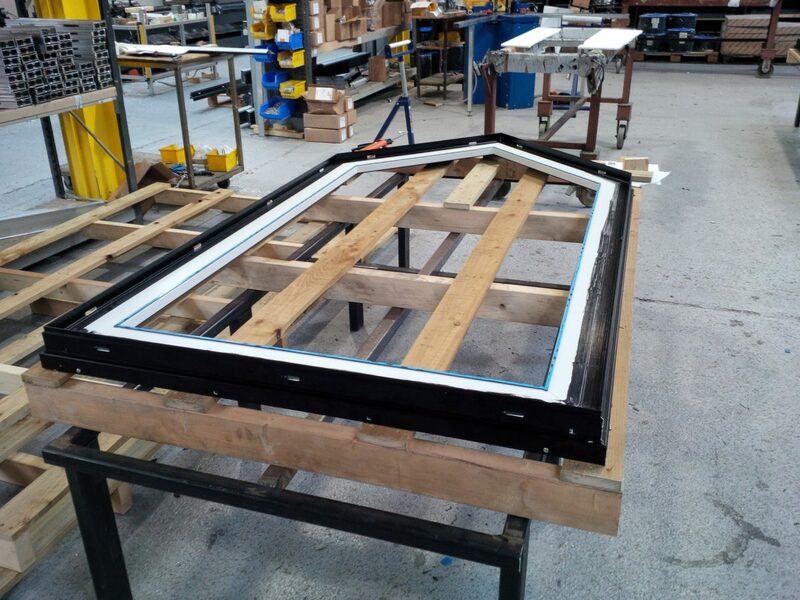 The frames are dual colour, coated with marine grade polyester powder coating; supplied in slate grey (RAL 7015) externally and matt white (RAL 9010) internally. They usually come factory glazed, as one unit for ease of installation; for the best easy to fit solution include our upstand which will give you the correct fall angle required. Our rooflights are fully tested to the CWCT guidelines (in accordance with the latest BS EN standards) for; air permeability, water tightness and wind resistance. Achieving the highest classifications possible. 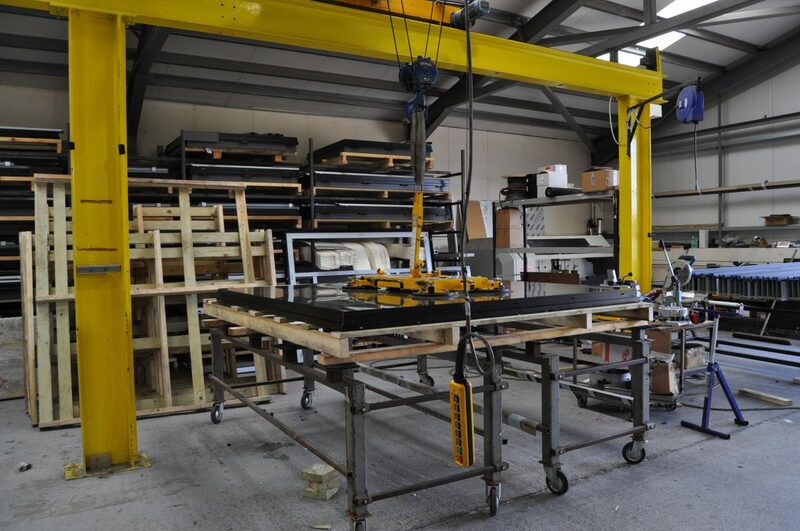 Our testing was conducted by Wintech Engineering Limited, who are an independent UKAS accredited test laboratory (no. 2223) and in addition to their impressive scope of accreditation, their partnership with the Glass and Glazing Federation (GGF) lead to them becoming the World’s first UKAS accredited glass impact test laboratory to BS EN 12600. U-values as low as 0.5W/m2 K – to suit low energy & passive house projects. Standard glass specification centre pane U-value is 1.1 W/m2 K.
Ideal for installation on flat or sloped roofs. We also offer a full installation service, for more information please see our installation page online or contact our offices. 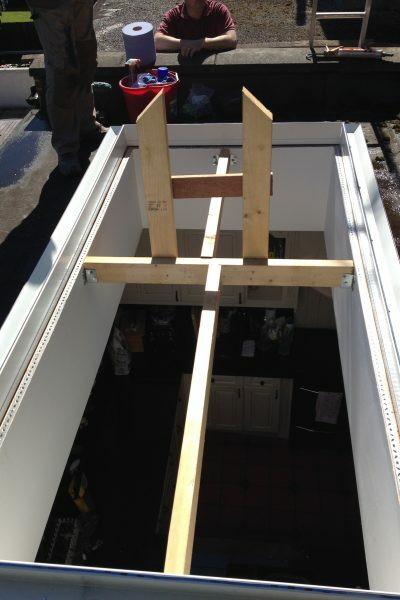 Our nationwide, delivery service means your rooflights will be delivered efficiently and safely to your address / site. Our online shop supplies to mainland UK ONLY; if you want to order from another location, please contact our offices. If you would like to talk to us about your specific requirements please do not hesitate to contact us on 01223 79 22 44 or email [email protected].